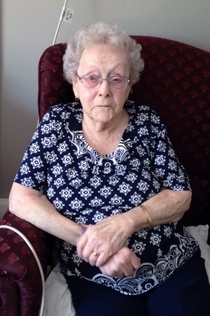 Obituary for Marion E. (MacNaughton) Holland | Adams Funeral Home Ltd.
Marion Elizabeth Holland, widow of the late Arthur Holland of Mount St. Joseph Nursing Home and formerly of Upper Black River Road, Black River Bridge, passed away peacefully at her residence on Friday, April 21, 2017 at the age of 96. Born in Black River Bridge, March 24, 1921, she was a daughter of the late Freeman and Barbara (MacLean) MacNaughton. She was a homemaker and a member of St. Paul’s Presbyterian Church in Black River Bridge. She is survived by three Daughters, Helen Pauls (Fred) of Calgary, Alberta; Dianne Wilson of Glenwood, N.B. ; and Brenda Watling of Upper Black River Road; two Step-Daughters, Donna Holland of Toronto, Ontario; and Patricia Perry of North Sydney, Nova Scotia; one Daughter-In-Law, Dawn Holland of Napan Bay; one Son, Vernon MacDonald (Shirley) of Keswick Ridge; two Step-Sons, Keith Holland (Ida) and Frederick Holland all of Miramichi; ten Grandchildren; three Step-Grandchildren; sixteen Great-Grandchildren; four Step Great-Grandchildren; as well as several Nieces and Nephews. She is pre-deceased by her first Husband Jack MacDonald, her second Husband Arthur Holland; one Son, Blaine Holland (2014); two Sons-In-Law Gerald Watling (2007) and David Wilson (2012); one Step Son-In-Law William Perry; one Sister, Catherine; three Brothers, Mervil; James; and Earle; one Grandson, Kevin Holland (2014). Visitation was at Adams Funeral Home Ltd., 140 King Street, Miramichi, on Monday. The funeral service was held from St. Paul’s Presbyterian Church, Black River Bridge, on Tuesday, April 25, 2017,at 2 p.m., conducted by Rev. Ross Wiseman. Music for the service was provided by Mrs. Barbara Somers and Calvin Presbyterian Church and St. Stephens United Church Choirs. The hymns were “In The Garden” and “Amazing Grace”. Rev. Wiseman offered the hymn “Count Your Blessings”. The scriptures were read by Rev. Wiseman. The eulogy was given by grandson, Rev. Brent MacDonald. The pallbearers were Brenda Watling, Diane Wilson, Floyd MacNaughton, John MacKay, Keith Holland, William Holland, Brent MacDonald, Mark Wilson. Interment will be in Black River Community Cemetery, later in the spring.